Let’s continue my Summer Mayhem by talking about the Fox & Badger Underground Masquerade party which happened just over a week ago. F&B have been in the scene for some time, and are notorious for hosting some of the most immersive and dark parties in London, with a slight kink twist to it. After finally going to one of their nights, I can confirm that their reputation is very well justified. Before delving into the details of why F&B was and is such a great success, let’s just put things into perspective: I am the kind of person that leaves a party by 3am. Always. I don’t even need a watch or a phone to tell me the time – my body just knows it. So imagine how stimulated and distracted I was that I left the party just before 6am. Yup, it has taken me almost 28 years to finally get home as late as everyone else. Anyway, let’s not deviate from the topic in question. 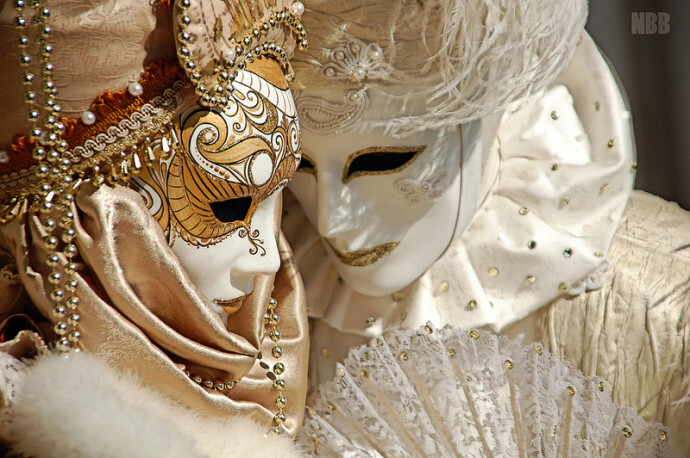 The theme of the night was Venetian Carnival Masquerade – so think ruffles, lace and mysterious flamboyant masks. The masks were compulsory and you had to wear them until after 1am. Maximum effort was of the essence, and people raised to the occasion. I was greeted by women in full length gowns, dripping in pearls and lace, while balancing delicate fascinators on top of victorian-esque wigs. The ushers were equally elegant, in long velvet robes and black lace gloves. Inside, the decor was equally impressive: dark lights, velvet floor cushions, drape curtains and pearls everywhere. It almost felt like Rome & Juliet meets The Great Gatsby. The party was held at the Steelyard by Cannon St. which was the perfect spot as it offered a comfortable sized dance floor, an elongated bar and a nice chill out area upstairs. From the moment you walked in, you could feel that no expense has been spared. There was always more than enough staff in the bar and the cloakroom, so you were never left waiting for too long. The music was techno – and it was the best techno you could have. As someone who is not particularly keen on techno, I kept myself away from the dance floor, but I could appreciate how good it was. On second though, it wasn’t that I purposely avoided the dance floor – there was just too much to do and I simply forgot! The entertainment was what really places this event apart from everything else. By the bar, there were acrobats on a loop – on the dance floor, there was a plethora of shows, from the usual pole dancers, to burlesque and baroque shows. There were gogo dancers everywhere trancing dancers by with a show of light. Upstairs, there was a massage corner. The night just keep going and I am sure I missed a lot of it. The night also welcomed some really nice and friendly people, so I was constantly chatting to people, some were familiar faces but a lot of them were just strangers who were having an equally great time. Would I change anything from that night? Truth be told, not really. It went over and beyond the call of duty to ensure the night was a magical one.